Parents - What are the rights and responsibilities of parents? Parents of deaf or hard of hearing students also have rights under the IDEA. Parents are equal members of their child’s IEP team, and their input and meaningful participation in the development of their child’s IEP is an IDEA requirement. Also, parents can apply the remedies set forth in the IDEA’s Procedural Safeguards if they disagree with the school over what their child needs, and/or how special education services are delivered to their child. For a more in-depth look at legal rights visit: What does special education law say about educational interpreters? Parents also have responsibilities to assure that their child will benefit from his/her education. Toward the fulfillment of these responsibilities, parents can receive Parent Counseling and Training as a Related Service on their child’s IEP, if it is determined to be a necessary at-home support for the child to benefit from his/her education. The purpose of Parent Counseling and Training is to help parents understand the special needs of their child, provide them with information about child development, and help parents acquire the necessary skills that will allow them to support the implementation of their child’s IEP. 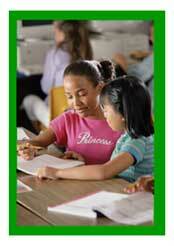 This may involve helping the parent gain skills needed to support IEP goals at home (IDEA Sec. 300.34 (b) (8) (i,ii,iii). Typically, these services are sought from qualified teachers, school counselors, psychologists, social workers, nurses, parent groups, disability organizations and/or professionals or representatives of community organizations. A common example often used to exemplify the purpose of IDEA’s Parent Counseling and Training is sign language instruction for hearing families of students who are deaf or hard of hearing. If the student is learning sign language and using an educational interpreter at school, but the family uses spoken English at home, there can be a huge communication breakdown between the child and his/her parents. That communication breakdown could inhibit a student’s ability to complete homework, practice new vocabulary, discuss what he/she is learning, and process new information. Ultimately, it could even prevent the student from making educational progress. Given the research that supports the importance of parental involvement in their children’s education, the spirit of the IDEA upholds this value through the provision of Parent Counseling and Training as a Related Service. The bottom line is that you can request sign language support for your family. Parents should ask about the educational interpreters’ certification and proficiency at every IEP meeting. This question is usually met with a head nod and “don’t worry, she’s great” response from the principal who probably hired the interpreter. So the parent’s next question must be about the demonstrated proficiency of the interpreters. What is the interpreter's EIPA rating? Are they certified? Who evaluated their qualifications, and what expertise did the evaluator have to do so? Click here to learn more: What Kind of Training is Required to Become an Interpreter, and for Students to use an Interpreter?